Tired of having a paw in your face every morning? Perhaps this year for Christmas Rex can get his very own dog bed! Choosing the right dog bed for your pet takes a little bit of time, but it will be worth it for both of you when you both have your own sleeping space. First, consider your dog’s sleeping style. Does he like to curl up in a ball or does he sleep sprawled out? Does your dog like to have something to lean against (like you) when he’s sleeping? Next, think about your dog’s size and activity levels. If you have a large dog a sturdy bed with a more durable fabric is probably going to work best. If your dog spends lots of time outside, consider a bed with a removable cover for washing. Finally, think about what will look best in your home and what beds will fit in your budget. At J&M Aquatics and Pet Center we have a variety of dog beds for all sizes of dogs and all budgets! 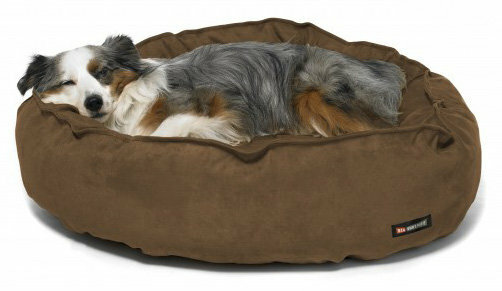 Older dogs will benefit from specially designed orthopedic beds. These beds provide more support for older or aching joints. 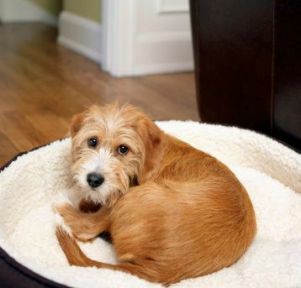 Donut or Bolster beds (above) are great for dogs who like to have something to lean against. These consist of a cushioned bed with raised sides. There are all sorts of sizes and types of these available. Pillow beds (top photo) are basically just giant pillows. These are great for dogs who like to sprawl out. Finally, if you have small dogs who lose body heat very quickly (like chihuahuas) consider a heated dog bed. It’ll keep them warm and toasty! It’s never too early to start planning for Christmas and you wouldn’t want Rex to be left out! So stop in today to check out our dog beds and other great Christmas presents like: waterproof and wool coats for dogs, ramps for older dogs, gates, stairs and even dog boots.